On the same weekend that the local community of food bloggers, influencers, and scenesters lined up to drool over hamburgers from New York City, a food court in Willowbrook reminded me of what really makes L.A. special. Not far from Watts, on the land that historically hosted Rancho La Tajáuta, there is a sprawl of folding tables, food trucks, trailers, and grills offering regional Mexican cuisine from the lesser known states of Guanajuato, Aguascalientes, Querétaro, as well as top notch Salvadoran pupusas. 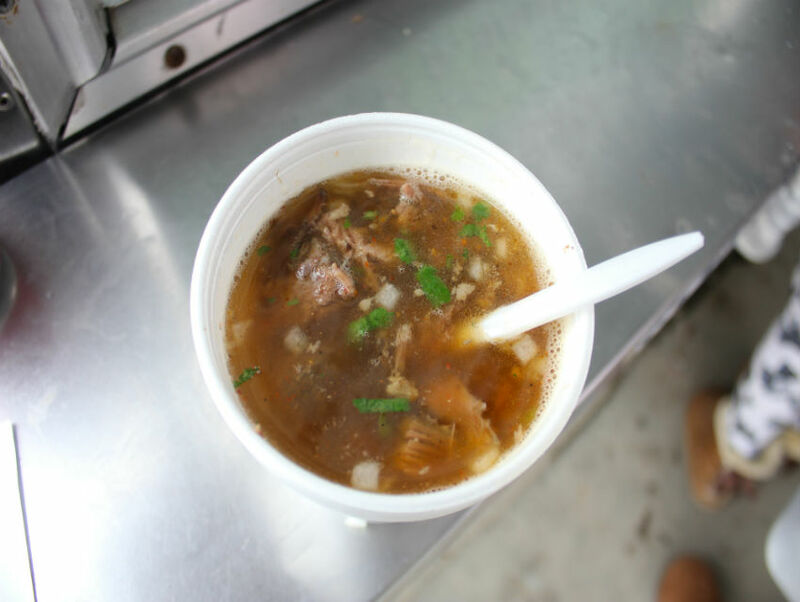 The 5-block stretch of the west side of N. Alameda, starting at E. Oris Street and ending at about E. 131st is home to Carnitas El Momo (Saturdays only) and their artisanal carnitas from the state of Guanajuato, as well as a pupusa stand that is only out on Saturdays. Right at Alameda and Oris is an Aguascalientes-style birria and gorditas truck, one of less than a handful of places representing one of Mexico’s smallest states and my family’s hometown. Thin gorditas are made to order and filled with cactus and potatoes in a bright red salsa and well as stewed chicharrones, both red and green. The birria covered with a mild tomato salsa is very good, too. Another stand out is Quesadillas La China. There are more than a dozen guisados, kept warm in discount store non-stick pots, for quesadillas and gorditas filled with tinga, mushrooms, huitlacoche, squash blossoms, picadillo (ground meat and vegetables), a mild and flavorful blood sausage (moronga), creamy beef brains, and spicy cubed pork in a dark chile pasilla sauce. 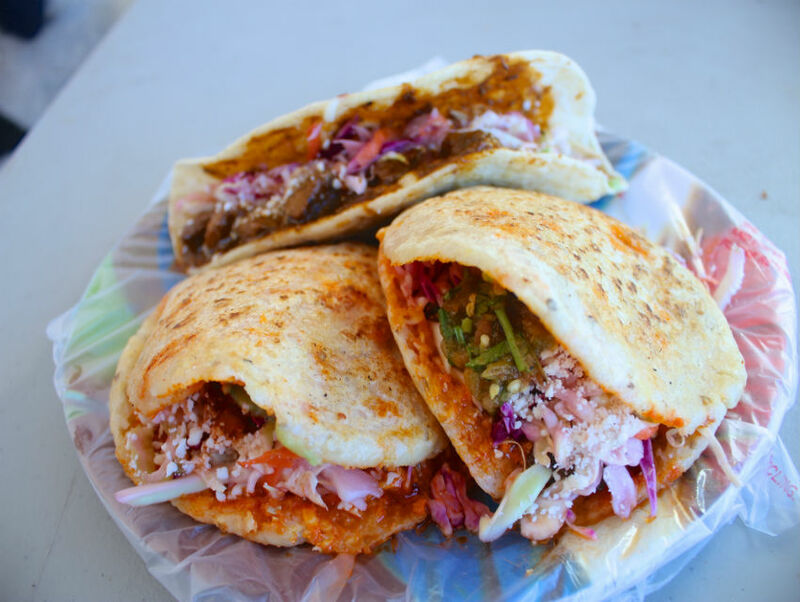 While the gorditas just around the corner from Aguascalientes have simple hearty stews, the thicker, firmer Querétaran gorditas are made to be dressed with salsas, shredded purple cabbage, and a dusting of cotija cheese. As it was in its original rancho days, Willowbrook is a place to go for some of the cuisines L.A. does best. It’s the seasoned cooks from Central America and Mexico, repping their hometowns without the accompanying scenester sideshow that are and destined to produce the best bites in L.A. Previous articleWhat Scott Frank’s Shaker Gets Right (and Wrong) About L.A.